A project scope statement is a useful tool to outline the project’s deliverables and identify the constraints, assumptions and key success factors. The well-written scope statement clearly defines the boundaries of a project. Before the project begins, the project team and the project stakeholders need to agree to the scope statement before project execution. A project’s scope has a direct impact on the other two elements of the project’s triple constraint – time and resources. If the project team can’t agree to the scope, the other two elements will keep changing despite the project manager’s best intention to execute the project. The project manager often resorts to the project scope statement as the formal documentation for accepted project scope. Some project scope statements run the risk of exceeding an academic dissertation when only a page was needed to convey project scope. Agile project managers recognise scope will adjust across the project lifecycle so compiling a tedious scope volume isn’t the best use of the team’s time. Figure 1 (below) displays the MindGenius scope statement template. When developing a project’s scope, the list of deliverables, constraints, boundaries, and assumptions is often the result of brainstorming. Using a mind map to capture an exhaustive list of deliverables and the refining them provides flexibility in the scope definition process. Once the ideas are reviewed, combined and vetted, the formal scope statement can be refined for presentation. Consider this scenario: Your director requests your involvement in a new website development project to share personnel and financial data with a third-party vendor. Your responsibility is to develop the scope and high-level timeline based on a set of meetings with your business customer. You need to facilitate the meetings and identify the project needs. How will you document the scope? By using MindGenius to facilitate the meetings, you can capture all the project scope details as the business customers brainstorm deliverables, constraints, assumptions and acceptance criteria. Using Map Explorer in MindGenius, the project manager can focus on specific project deliverables without displaying other sections of the mind map (Figure 2, below). Once the deliverables are agreed upon, the mind map can be refined and the branches can be collapsed. MindGenius helps to organise the different parts of the scope statement to communicate a view that is easy to understand. Project stakeholders don’t want to read more than a page describing the project scope. Since most project deliverables (scope statements, charters, and requirements) are converted into a PowerPoint presentation for executives, MindGenius helps reduce the administrative burden by exporting to Microsoft PowerPoint or Microsoft Word. The visual format of the MindGenius mind map helps to convey the project scope without having to read pages of documentation. I’ve conducted numerous brainstorming sessions to develop a project’s scope and using mind maps is an excellent way to plan, prioritise and communicate using colors, picture and lines to identify important ideas and key questions. Figure 3 (below) includes the completed mind map example. Similar mind map formats can be used for project charters, communication plans, work breakdown structures and meeting minutes. Meeting minutes are often an administrative bore, yet by creating meeting minutes in a visual mind map format, I’ve found it keeps team members more engaged. The mind map acts as the meeting agenda and the meeting minutes are created real-time as the project manager appends notes to each of the agenda nodes. 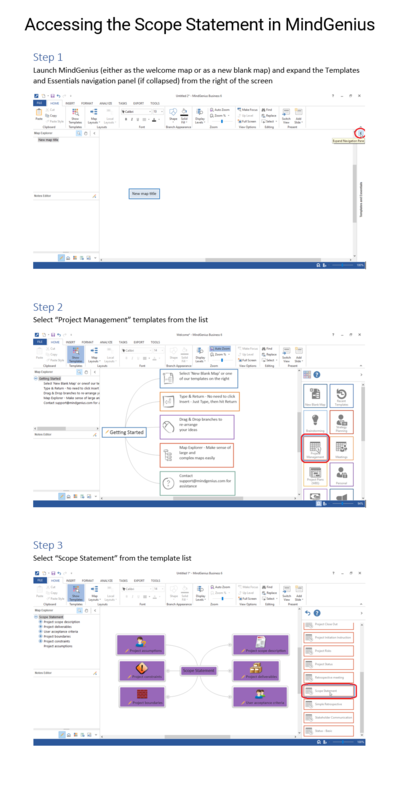 Instead of creating separate document, I create a PDF of the mind map and send it to the team after the meeting. Meeting minutes and scope statements are just two examples of the project deliverables that can be created using MindGenius. The ability to communicate visually helps team members comprehend complex problems easier. Project stakeholders like the visual communication because pictures simplify the overall project scope, challenges, and successes. I find stakeholders, PMOs and executives are always looking for better visual dashboards. Mind maps are an excellent solution to add to any executive reporting deck due to their visual nature. In stakeholder reviews, I’ve used visual mapping to create more engagement and discussion instead of the typical bullet points that are glazed over and hardly read. The graphical nature of the mind map further enables discussion as project stakeholders discuss challenges, reprioritise requirements and continue to refine the mind map. Try creating more engagement from your stakeholders with mind map. to start applying visual thinking to your projects today! An example of a completed Scope Statement can be viewed here.